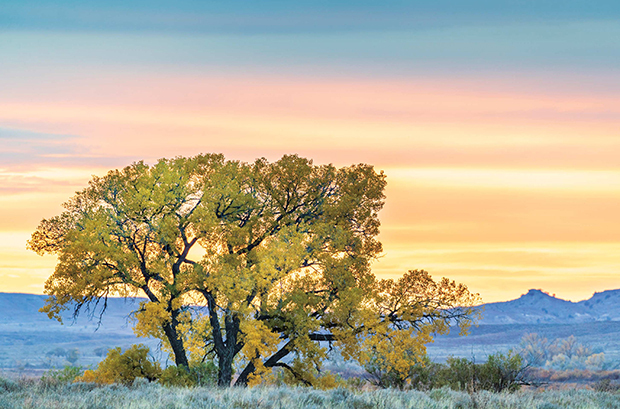 As the weather starts to cool down, it’s time to get out and enjoy all autumn has to offer. We’ve rounded up a massive list of festive events from all over the state, including pumpkin patches, corn mazes, hay rides, and Oktoberfests. Running for six consecutive weekends, Beachtoberfest activities include a 5K fun run, a music festival, craft beer tasting, a barbecue competition, the Texas Super Chef Throwdown, Old Town Festival, Port A Art About, Harvest Moon Regatta, Parrot Heads Wings Over Port A, and the 34th annual Songwriters Showcase. 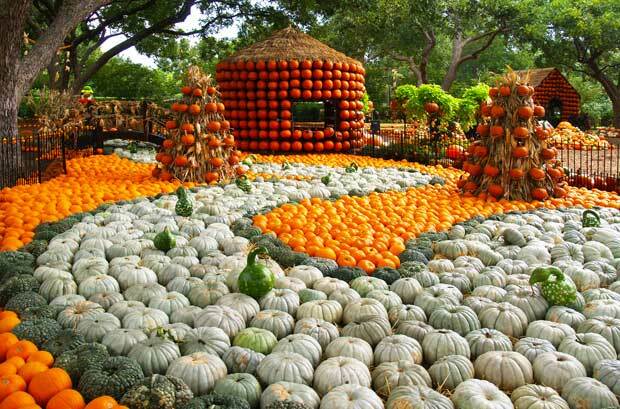 The Dallas Arboretum and Botanical Garden is a spectacular show of color with 4,500 of fall’s favorite flower—Chrysanthemums—along with 150,000 more stunning, fall blooming plants, the internationally acclaimed Pumpkin Village, featuring more than 90,000 pumpkins, plus the outstanding Children’s Adventure Garden. This Halloween theme park hosts unlimited tours of its major attractions, scores of professional actors, activities, food and drink, and games. Come take a stroll in Southlake’s town square while looking at handcrafted arts and crafts. Also expect great food, live music and entertainment, and the popular wiener dog race. Learn the history of some of Gladewater’s historic buildings while hearing the legends behind the haunts. At Love Creek Orchards, enjoy unlimited hayrides, a hay bale maze and giant hay stacks, a petting zoo, and an apple orchard tour. Visit the cider mill and apple processing, purchase and paint a pumpkin, For a small fee you can, ride a pony, take a barrel train ride, face painted (weekends only), and complete a sand art project (weekends only), build a pomander, and feed the animals. Celebrate the fun and flavor of Fredericksburg’s German heritage with three days of music, food, drink, dancing, arts and crafts, children’s entertainment, and more at this 38th annual event. Activities at the Pipe Creek Christmas Tree Farm will include a hayride, hay jump, scarecrow dressing, visiting farm animals, and pumpkin painting with the purchase of a pumpkin. 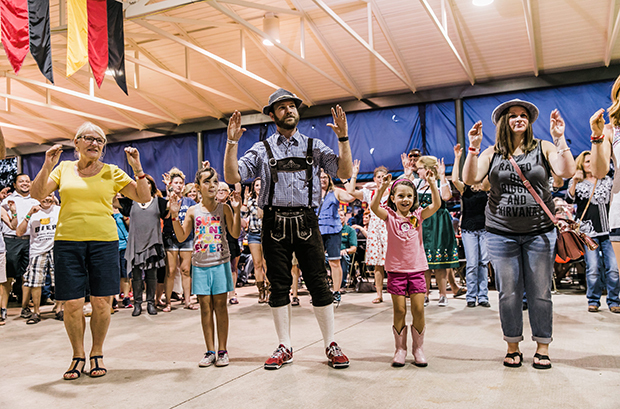 This is the sixth annual event providing a taste of Germany in North Texas. Enjoy entertainment all day, German food, dachshund races, live music, arts and crafts, a fun run, and more. The official tapping of the Oktoberfest keg will be at noon on Saturday. Enjoy more than 100 varieties of craft beer, authentic German cuisine, and live music. Underneath the event tents, find live music along with authentic German cuisine of sausage and pork schnitzel. Children’s activities will be held on the courthouse lawn. Kicking off with a street dance on Saturday night, the festival opens on Sunday at 10 a.m. Let the kids play games, decorate pumpkins, and take a mini-train ride while you enjoy a variety of ethnic foods and (perhaps) start a bidding war at the auction. Sample wines from Texas wineries, enjoy food from local chefs, and shop for one-of-a-kind wares made by Texas artisans. Hayrides, a pumpkin patch, and s’mores-making at the fire pit are all available for the kids. Enjoy a 5.5 acre maze, a huge pumpkin patch, picture stations, and a petting zoo with live baby animals. Celebrate the season at Varner-Hogg Plantation State Historic Site, and learn about harvest time on an 1800s plantation. Activities include hayrides, crafts, sugar cane, storytelling, and more. Night tours of the Fort Concho National Historic Landmark offer true and possibly scary tales taken from the records. Pumpkins, sweet treats, and fall decor are available for purchase, alongside games to play, photo spots, and the Chamber Choo-Choo. Come out and get the scare of your life at the largest Halloween event in the area. Explore the Lake Madison Park walking trail at dark as a haunted forest, and watch out for ghosts and monsters jumping out of the dark to give you a fright. Businesses, organizations, and families share treats and activities with children in the downtown district. Enjoy a halloween carnival with a haunted house at Old Mill Trade Days. Enjoy a historic haunted hayride at Fort Inge and learn about the fort’s haunting legends with stories told around campfires. Bring lawn chairs and blankets, and see pumpkins glowing, floating, and reflecting light as soon as it gets dark in Badu Park. If you would like to participate, bring your already carved pumpkins with a candle or light (please no paint or glitter to protect the river from anything unnatural). Sandstone Cellars’ annual Halloween party features local Texas vineyards, free winetasting, music, and fun. Dress up in your Halloween best while running barrels at the third annual event. This evening tour of historic cemeteries features re-enactors in an educational and entertaining setting looking back into Victoria County’s rich history. Enjoy fun, family friendly trick-or-treating event at the Texas Zoo. Take a spooky nighttime stroll through the woods to the plantation’s 1840s-era Patton Family Cemetery, and learn about mortality on the plantation during the 1800s and the dangers of the early Texas wilderness. Then, step into the plantation house for a candlelit look at the death of the site’s last owner, Governor James S. Hogg, and the effect it had on his family, as well as his plantation. Enjoy arts and crafts vendors, food, old-fashioned children’s games, wool-spinning demonstrations, music, tours of historic buildings, and a Native American teepee. Resaca de la Palma State Park will host spooky family-fun activities, including a zombie 1-mile fun run/walk hosted by 2 Run Crew. The eighth annual festival will include trick or treat stops at local businesses throughout downtown Galveston. Saengerfest Park will be the central location for fun, with games, arts and crafts, face painting, balloon artists, and a costume contest. 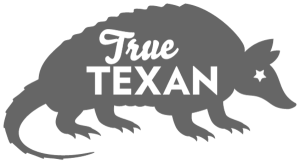 The eighth annual event includes a 5K/10K run/walk and a free kids’ fun run. After the run, enjoy free food, games, a costume contest, music, awards, and more. Dress up in your Halloween costume, and enjoy crafts, games, and other special programs at Sea Center Texas. At this spook-free trick-or-treat event, Chandor Gardens is decorated for Halloween, and costumed characters hand out candy throughout the gardens to costumed children. An evening of safe and traditional family fun includes trick or treating, games, food vendors, bounce houses, and more at Louise Hays Park. Local businesses, churches, and organizations provide candy and other activities in a fun and safe environment on the town square. There will be a best-decorated “trunk” contest. Bring your kids out to see trunks decorated for Halloween and filled with candy. No tricks, only treats when you spend Halloween on Main Street. Vendors line the street with a variety of arts & crafts, goods, and even a food court. The evening with be filled with fun activities such as a costume contest, thriller line dance, and a bounce house. Participants will enjoy pumpkin painting, face painting, crafts, games, costume photo ops, trick-or-treating, and other activities all for free. Many Main Street businesses will open their doors for special hours and trick-or-treating. 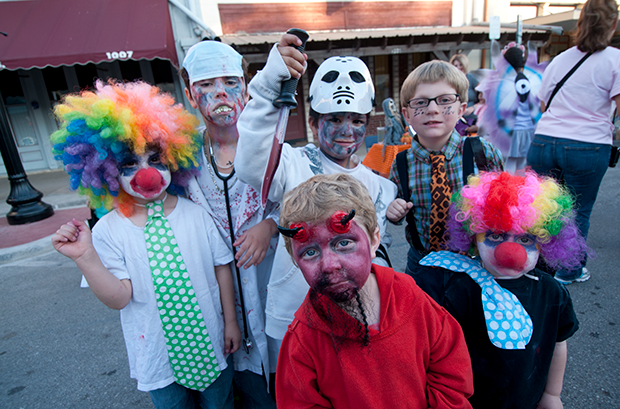 Youngsters go door to door at businesses downtown for candy and to show off their costumes. Festivities include Halloween games, live music, face painting, snow cones, balloon animals, and bounce houses.